Scratchbuilding (making model buildings from scratch) is the art of creating structures or other models out of raw materials – sheets or strips of plastic or wood, glue, paper, cardboard, etc. Some fantastic buildings, locomotives and railcars can be built very inexpensively and without requiring much more time than it takes to build and paint a kit. There are many benefits to scratchbuilding as previously outlined on the “Buildings” page. What type of model railroad structure do you want to build and why? •	How will it fit into your layout theme, era and locale? •	How much space do you have for it? •	Will it need to be close to the tracks? •	Will it require a track on both sides or through the middle? •	Does it need a sidewalk, road, dock, or parking lot? •	What are the dimensions? 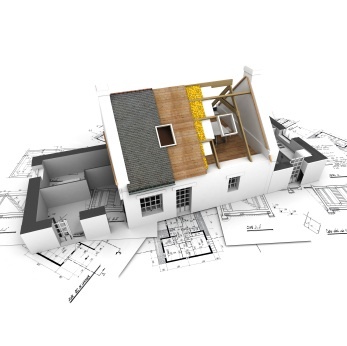 After you answer these questions, draw the model building out on paper, or with your CAD program if you have one. 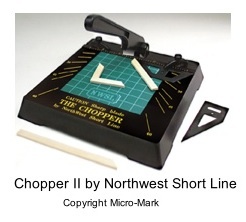 Label the drawing with proper dimensions in the scale you’re using. 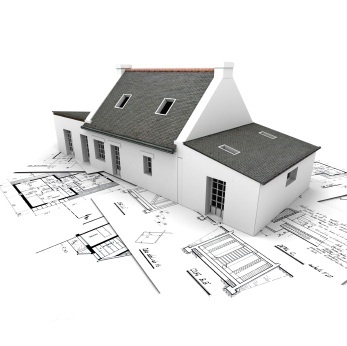 If you would rather use a plan that has already been created, you may want to visit the Scale Model Plans website which is dedicated to creating and selling plans for scratchbuilding projects. Once you have selected or designed a structure on paper or on the computer, you can use the materials and scratchbuilding techniques described below to build it; or you could use a laser cutting service, or even your local sign shop to create the parts. There are some artists who will design, create and scratch-build or kitbash the whole structure for you if you wish. One of these is Jimmy Simmons of Monster Modelworks. However, if you would like to get your hands dirty and learn how to do this yourself, which of course, happens to be the most economical way as well, then read on to learn some basic techniques upon which you can grow and even create some of your own techniques. Don't be afraid to experiment. And don't worry if your first attempt isn't that great. Each time you try, you will get better. Soon, you will be doing your own clinics at the NMRA Convention. The substructure can be made with styrene, which is probably the most commonly used material for scratchbuilding. You could also use mat board (the material used in photo framing), gel foam or balsa wood. These latter materials are easier to cut but perhaps not as durable as styrene. The wood may be more suitable for larger scales, like S and O. Laserboard is also becoming popular now as a more realistic material to use in scratchbuilding structures. To cut styrene to make substructure walls for your model building, use a metal straightedge and a scribing tool. Scribe along the line to be cut several times, and then pick up the styrene and bend it forward to snap it at the scribed line. To make window and door openings, first draw on the styrene where you want these to be, extending the lines to the edges of the styrene on both sides. Scribe and snap the styrene at these lines. Discard the pieces where the openings will be and glue the other pieces back together on a flat surface. 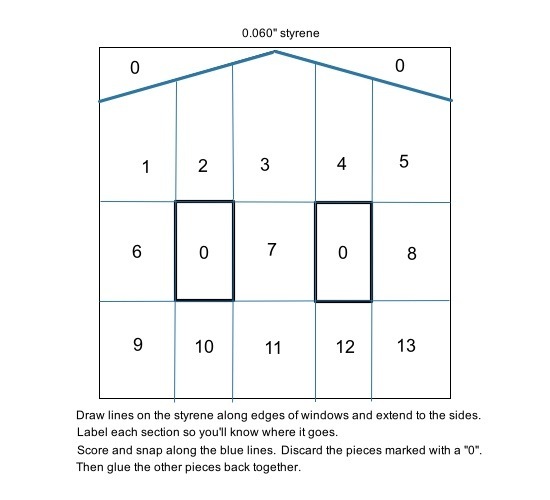 "When cutting window openings in styrene, (For starters I would suggest .040 not .060) you can cut the lines for the outside of the window, and then cut an X from corner to corner. This allows the opening to be snapped out without having to glue the rest of the wall back together. Use a small file to clean up the opening. Once the substructure walls are completed, you can glue on a trimmed sheet of purchased embossed vinyl or plastic masonry or siding (produced by Plastruct, Kibri and others). This sheet should be a little larger than the substructure so that when you glue the walls together there won’t be a gap at the corners. (Or, after the building is put together, you could just glue on trim-corner-strips to cover any irregularities in the corners.) After the sheet is glued on, use a hobby knife to carefully cut out the openings for the windows and doors. The windows and doors for your model building can be purchased separately from a company like Grandt Line, which is what I would recommend, especially if you are modeling in N or Z scale. If you are going to be using purchased windows and doors, you will have to measure your openings and cut them so the windows will fit. If you’re working with larger scales, you can scratch build these items if you wish. •	Use 1x4’s to frame the inside of the window flush with the siding. Then glue on a 2x2 sill and 1x4 trim around the outside of the window. •	Then use 2x2’s the make the inner frame trim around the sides and the top of the window. 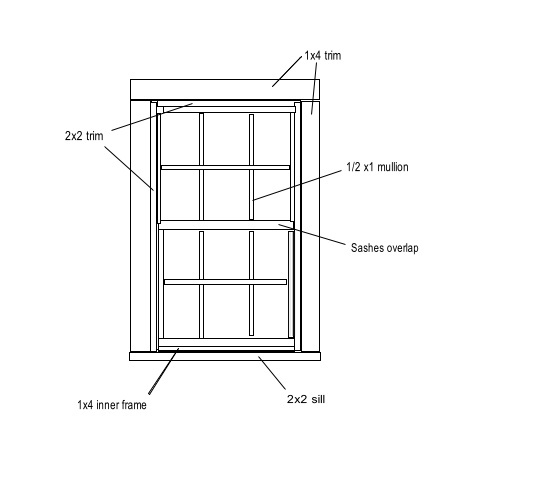 •	Use 2x2’s to make the upper and lower sashes for a double-hung window. Start by making the 2 frames for the sashes, and then add the inner trim (mullions) using the ½ x1 strips (for the edges of the window panes). •	Glue the upper sash in place against the back of the 2x2 trim. •	Then glue the lower sash in the window from the back overlapping the top of upper sash. •	Then you can paint the window and the frame. •	Use scale 1x4 strips for the frame for inside the doorway. •	Put a 2x4 sill along the bottom. •	Use a sheet of 0.02" styrene to make the door. •	Add a 1x6 strip to the bottom of the door, then 1x4 strips along the sides and top. •	Use 1x4 strips to make the inner door trim in the shape of an upside-down cross. •	Use strips of 2x2’s as doorstops on the door frame across the top and down both sides. 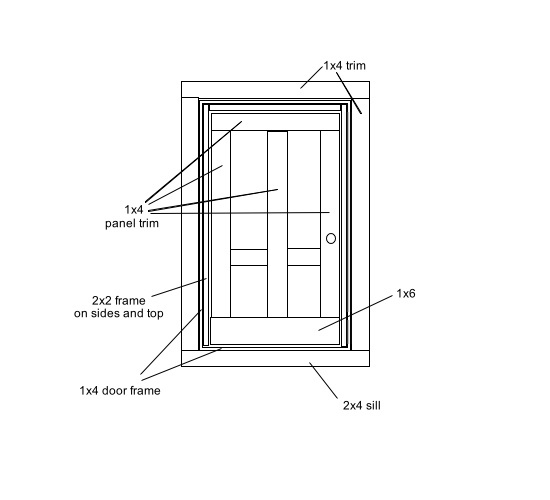 •	You can then paint the door and glue the head of a pin on the door to simulate a doorknob. After you've installed the windows and doors, you're ready to glue the walls together. 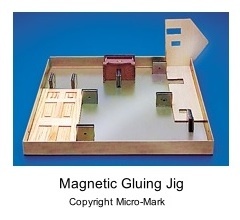 It's extremely helpful for all your model building to use a magnetic gluing jig such as the one cataloged by Micro-Mark. This will help square things up and hold them in place while the glue is drying. The roof for your model building can be made out of cardstock or matboard as well as styrene, and then covered with an appropriate vinyl or plastic roof sheeting material that you can purchase (from Plastruct, et al. ); or you can make your own shingles. There are lots of different ways to make roofing shingles. The following method may be one of the easier ways of roofing your structure. You can probably even devise your own method later, but this will get you started. •	Buy some pinking shears at your local craft store that will give you the kind of pattern that you want for your shingle edges. •	You will also need gummed (contains adhesive that has to be moistened) kraft paper, which tends to stick to cardstock or matboard better than it does to styrene. If you’ve used styrene for the roof, you may have to use regular glue to get the paper to stick better. •	With a pencil and straight edge, draw parallel horizontal lines on the subroof. •	Then cut the gummed paper with the pinking shears into strips – a little wider than the space between the lines you drew on the roof. •	Then, along the next parallel line glue a notched strip; glue another strip above that, and continue this till you get to the top. 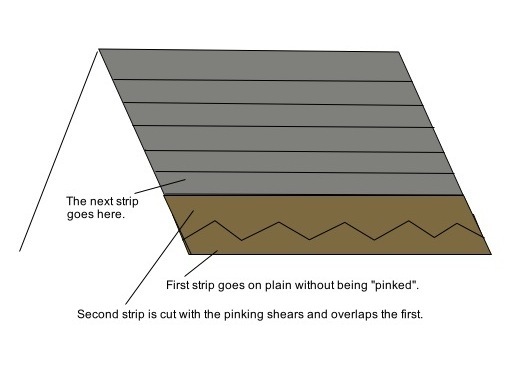 Stagger each new strip by 1/2 cut to the right or left to create a diamond-like pattern on the roof. •	Then do the other side of the roof the same way. •	You may need to do some trimming later with a razor blade but wait until it’s all dry first. The paper won't cut very well and may tear if you try to cut it while it's wet. •	You can then paint it and weather it, as you like. Don't forget to add details like chimneys, roof vents, eaves, awnings, flower boxes, window air conditioners, gutters and downspouts, trash cans, lamps, decals, people and pets, etc. 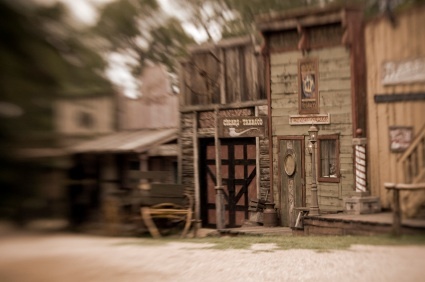 The details are what make your model buildings come alive. Most or all of these items can be found in the Walthers catalog. Various excellent and entertaining video tutorials on DVD are available here about how to build a model railroad. Lots of scratchbuilding techniques are included. Keep an eye on the railroad forums (listed on the "Comments" page) periodically to look for postings of lots of different ideas, projects and new methods of model building written by true model railroad craftsmen. From "Model Buildings from Scratch" to Model Railroad Buildings"
From "Model Buildings from Scratch" to "Homepage"